The surface of wood can be riddled with natural crevices, pores, and grain lines which do not promote a flat, even surface for finish application. When applying finish, most varnishes and polyurethanes will tend to seep into these natural cracks and crevices. This may result in near-microscopic hills and valleys in the finish coating that diffuse light and promote a “shallow” wood appearance in general. Multiple finish coatings, as well as sanding of each coating in between applications, can be required before you can achieve a smooth, flat surface which promotes the natural depth and beauty of finished wood. But what if there was an easier way? 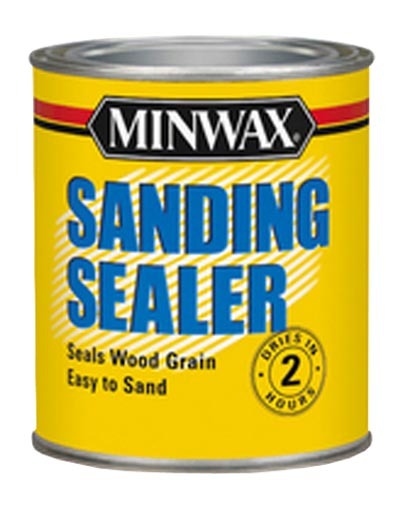 Turns out, there is via a product called Sanding Sealer. Sanding sealer is a preliminary, clear finish undercoating that allows you to build up finish thickness in natural crack and crevice areas, thereby filling these cracks (etc) to promote a flat surface for finish application. Note that sanding sealer is much easier to sand than traditional finish coatings (like varnish, etc). The use of sanding sealers can greatly reduce the amount of sanding time in between finish coatings, and can even help to reduce the number of finish coatings required to achieve a smooth, flat surface. Sanding Sealer can be purchased (by name) as a pre-mixed product ready for use right out of the canister, or it can be made. In most cases, sanding sealer results from thinning de-waxed shellac with denatured alcohol (basically 2 parts denatured alcohol to one part shellac). De-waxed shellac is particularly important if you select to mix your own sanding sealer, as you want to ensure the finish coat you use will adhere properly to the sanding sealer undercoat. If you plan to use a pigmented stain, begin by staining all wood pieces and allowing proper drying time. Once the stain has completely dried (or if you selected not to apply stain), you may proceed with the initial coating of sanding sealer. Brush the sealer liberally onto the wood surface with a soft bristle brush to achieve a fairly even coating. Allow proper drying time (usually about 1 hour). Sand the dried wood surface with, 220 grit sandpaper, in the direction of the wood grain. If you have stained the wood surface, sand very lightly so as not to sand through the sealer coating and remove stain pigment. Remove sanding residue and inspect the wood to see if further coatings are necessary to attain a flat surface for finish application. HINT: If cracks and crevices appear to be shiny after sanding, it is because the sealer coating is not level with the face wood surface where the sandpaper could reach it. Repeat the sanding sealer application and sanding process noting that you may re-coat as many times as necessary. Once the final coating has been applied and sanded, proceed with application of your selected finish (generally a minimum of two coats). Above all, practice with all products on a scrap piece of wood initially. This will allow you to become familiar with product use, product compatibility, and general work times required. It will also allow you to address any questions or concerns before you apply any product to your completed wood assembly. Best of all, experimentation will give you a great example in reference to what the wood will look like once finishing has been completed. Thank you for sharing. Professionally cleaning wood floors, first requires sanding and refinishing to adequately remove scratches and years of damage.